Intrigue and deception. Wellington and Napoleon. A secret code that comes down to a matter of numbers . . . And once again Arianna finds herself in a battle of wits with the Emperor . . .
With the threat of war looming over the Continent now that Napoleon has re-seized the throne of France, London is abuzz with intrigue as diplomats from the European powers gather to negotiate a military alliance against him. But Lady Arianna and her husband, the Earl of Saybrook, are intent on staying clear of the conflict, deciding it’s a battle for nations and armies to fight . . .
Until things turn very personal. 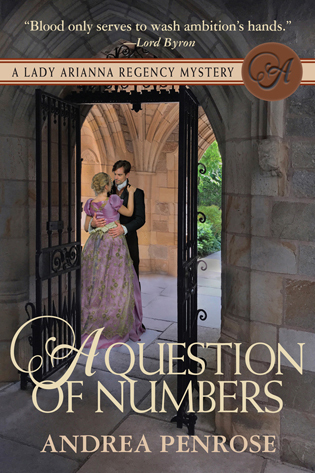 When a Prussian diplomat is murdered, two items found in his pocket force Arianna and Saybrook to once again become reluctant allies with the shadowy head of British security and undertake a rescue mission to Brussels, where lies and deceptions swirl within the ballrooms of the British expatriate community as the armies of Wellington and Napoleon prepare to clash. A friend, thought to have been killed in Elba, may in fact be alive and a French prisoner—putting his young daughter in danger of been kidnapped from her convent school and used to force her father into revealing critical military secrets. The mission is made even more complicated by yet another threat to Britain’s shaky military alliance . . . and the presence of an enigmatic Spanish beauty whose history with Saybrook is fraught with unsettling questions. Love, friendship, loyalty. Trust will be tested as Arianna and Saybrook race against time to help defeat the advancing French army. And as Arianna finds herself matching wits with Napoleon, it will once again all come down to a matter of Luck . . .
“I never thought to hear you, of all people, offer him any praise, however faint,” grumbled the earl. Arianna and the shadowy minister in charge of state security for Great Britain had a fraught history. They had first clashed when he had used her to cover up a scandal within the highest circles of the government. Save for Saybrook’s intercession—and unexpected marriage proposal—he would have quashed her like a gnat when the affair was done, because she knew too much about the sordid details. But of late their mutual dislike had mellowed . . .
“I’m merely giving the Devil his due,” replied Arianna. Saybrook muttered a rude oath. But his bark lacked any bite. She suspected that he, too, no longer saw Grentham as Satan Incarnate. However, that didn’t mean either of them trusted the man. His world was ruled by lies and deception. While theirs . . .
She took her husband’s arm. The drawing room was ablaze with the crystalline fire of myriad candles set in the ornate chandeliers. Their reflections winked off the glittering medals and gold-braided splendor of the diplomats and military men gathered for the occasion. The music of power and privilege echoed off the fluted colonnading and decorative paneling—muted laughter, the clink of crystal, a string quartet playing Haydn. “Thank you for coming.” Lord Charles Mellon, Saybrook’s uncle, broke away from a group of Austrian dignitaries to come and greet them. A senior diplomat with the Foreign Office, he was one of the men in charge of convincing Britain’s European allies to put aside their petty squabbles and agree on a united strategy for dealing with Napoleon, now that the former emperor had escaped from Elba and returned to France to retake his throne. “I see you managed to coax the Russians and Prussians to be here, along with the Austrians,” observed Saybrook. 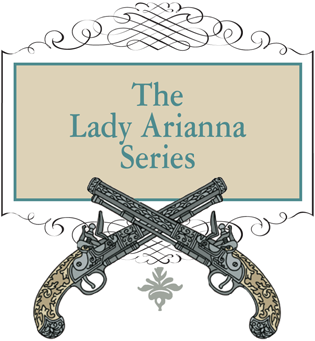 “I don’t envy you the task, Charles,” murmured Arianna. “Herding a roomful of feral cats would be a far easier feat.” In truth, Russia, Prussia and Austria seemed more caught up in scheming against each other to become the dominant power in Europe than in uniting to fight Napoleon. Mellon took care to maintain the façade of a host simply making casual pleasantries. His smile became more pronounced as he took her by the arm and indicated that the three of them should move to a more secluded spot near the entrance to the side salons. But Arianna didn’t miss the flicker of unease in his eyes. “To conquer the world,” finished Mellon. Though the Duke of Wellington was about to take command of an army just outside of Brussels, it was pitifully small, and the majority of his troops were untested in battle. “The truth is, he can’t beat the French on his own,” continued Mellon.